Exhibiting both homogeneous and heterogeneous catalytic properties, nanocatalysts allow for rapid and selective chemical transformations, with the benefits of excellent product yield and ease of catalyst separation and recovery. This book reviews the catalytic performance and the synthesis and characterization of nanocatalysts, examining the current state of the art and pointing the way towards new avenues of research. Moreover, the authors discuss new and emerging applications of nanocatalysts and nanocatalysis, from pharmaceuticals to fine chemicals to renewable energy to biotransformations. Readers will also learn about the latest spectroscopic and microscopy tools used in advanced characterization methods that shed new light on nanocatalysts and nanocatalysis. Moreover, the authors offer expert advice to help readers develop strategies to improve catalytic performance. 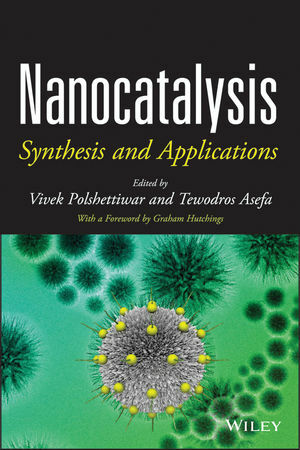 Summarizing and reviewing all the most important advances in nanocatalysis over the last two decades, this book explains the many advantages of nanocatalysts over conventional homogeneous and heterogeneous catalysts, providing the information and guidance needed for designing green, sustainable catalytic processes. VIVEK POLSHETTIWAR, PhD, is Reader heading the Nanocatalysis Laboratory in the Department of Chemical Sciences at the Tata Institute of Fundamental Research. His research examines advanced nanomaterials, catalysis, and green chemistry. TEWODROS ASEFA, PhD, is Associate Professor in the Department of Chemistry and Chemical Biology and the Department of Chemical and Biochemical Engineering at Rutgers University. Dr. Asefa is also Interim Director of the Rutgers Catalysis Research Center.